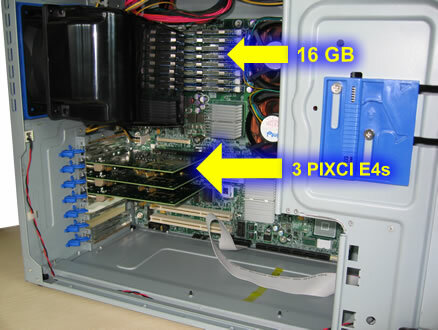 To test XCAP software for 64 bit Windows and 64 bit Linux, we built an imaging system in an Intel server chassis with 16 gigabytes of DRAM using eight, 2 gigabyte memory modules. Three PIXCI E4 frame grabbers were installed each connected to a 1280 by 1024, 500 frame per second camera. Each camera generates 625 megabytes per second of data. The PIXCI E4 frame grabber, with a maximum sustained data transfer rate of 700 megabytes per second, exceeds the camera’s maximum bandwidth. Simultaneous capture from the 3 cameras generates a data transfer rate of 1875 megabytes per second to computer memory. 14 gigabytes of memory was reserved for image capture with 2 gigabytes left for the operating system. A 6 second event of 3000 images was captured from the three cameras using XCAP. Notes about EPIX’ 64 bit software and PCI Express hardware follows. EPIX offers 5 frame grabbers with 64-bit memory addressing capability. The PIXCI EL1, EL1DB, E1DB, E4, and the E4DB frame grabbers provide the interface between camera link cameras and the PCI Express bus. All 5 boards have 64-bit memory addressing which allows them to store images to more than 4 gigabytes of memory (less the memory reserved for the operating system). Most of today’s computers only support 32-bit memory addressing. An imaging system with 32-bit memory addressing can address no more than 4 gigabytes of memory. To access more than 4 gigabytes of memory, the operating system, motherboard, CPU, and imaging software must also support 64-bit memory addressing. The latest release of EPIX software includes 64-bit versions of ready to run XCAP, the XCLIB developer’s library, and the PXIPL processing, measurement, and analysis library. EPIX is an Intel value added reseller. EPIX builds computer systems configured for imaging and installs and tests the complete system prior to shipment.